It’s the final dress rehearsal of the school Nativity play and every character wants to be featured on the cover of the programme. There’s so much talking and arguing that their teacher threatens to cancel the performance. Just in time they realise who the real star of the show is – Jesus lying in the manger. Alison Carver’s new Christmas musical is an ideal length for this age group and has easy speaking parts. The songs are imaginative, fresh and appealing. The free CD includes both backing tracks and vocal versions of the songs, and photocopiable song texts. Nearly No Nativity by Alison Carver is published by Kevin Mayhew and is our 19431st best seller. The ISBN for Nearly No Nativity is 9781848670044. 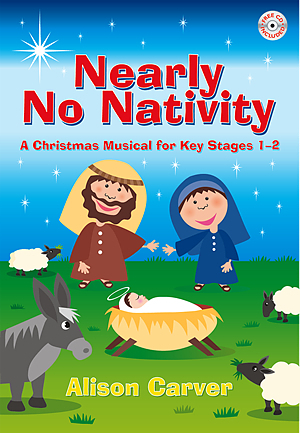 I worked as a teaching assistant in a Muslim registered where the unit leaders for KS1 asked me to direct a production of 'Nearly No Nativity'. This was not an easy task, with a cast of roughly 90 children in a fairly small school hall. Fortunately, the children loved this show so much it made a joy to direct. The songs are really catchy, and I regularly found children walking around school singing the songs. The script is simple, yet presents a suitable challenge for the children in terms of learning the lines. Everyone felt like they were really involved and the school said it was the best KS1 nativity they had ever seen! Thanks to Alison Carver for writing such a superb production! Got a question? No problem! Just click here to ask us about Nearly No Nativity. Now Playing: A great, great story Your browser does not support the audio element.